"When we're in love, that heady, jazzy feeling makes us want to dance...The cello part has an extra version (free) that is an octave higher for those of you who are really, really in love..."
"This classic air by Bach is a popular selection for both weddings and concerts." "Pantaleon Enrique Costanzo Granados y Campina (27 July 1867 - 24 March 1916) was a Spanish pianist and composer of classical music. His music is in a uniquely Spanish style and, as such, representative of musical nationalism. Enrique Granados was also a talented painter in the style of Francisco Goya." "The Paraguayan guitar virtuoso Augustin Barrios Mangore was a master of composing music in the 19th century Romantic idiom and the melody from this well know guitar solo just soars on the cello. Play with love in your heart." "Elgar finished the piece in July 1888, when he was engaged to be married to Caroline Alice Roberts, and he called it "Liebesgruss" ('Love's Greeting') because of Miss Roberts' fluency in German. When he returned home from a holiday, he presented it to her as an engagement present. This arrangement can be played in standard tuning (slightly easier) or with the 6th string tuned to D (slightly harder but more delicious!)." Looking for something else? 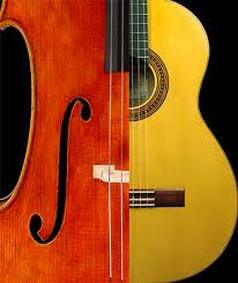 No worries, we have over 150 Cello and Guitar scores to choose from!